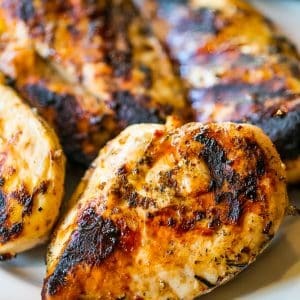 Perfect Grilled Chicken Breasts - the best grilled chicken recipe ever! Delicious, never-dry juicy and flavorful Perfect Grilled Chicken Breasts are perfect for cookouts and picnics – or even chopped up cold for a sack lunch! These chicken breasts are juicy, tender, and full of smoky, earthy flavor everyone begs for again and again. When you think of summer, you think of firing up the grill, right? It’s only natural- grilling goes with summer like peanut butter goes with jelly. But the other thing that is kind of synonymous with summer grilling?? Chicken is one of the easiest things to fall flat on the grill. It can be dry, rubbery, and inedible- but it doesn’t need to be! This recipe for perfect, juicy, never-dry chicken couldn’t be any easier. We’re using a few simple ingredients you probably already have on hand to make sure your chicken doesn’t dry out on the grill- it’s still perfect and flavorful even the next day in salads! JUST TAKE ME TO THE BEST GRILLED CHICKEN RECIPE EVER ALREADY! 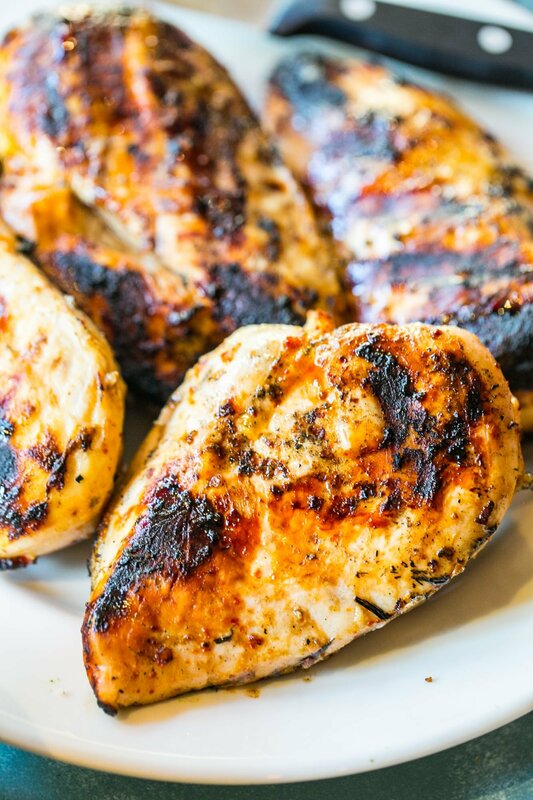 If you’d rather skip my (very helpful, i think) tips and tricks, essential cooking info, and similar recipe ideas – and get straight to this deliciously easy Never Dry Grilled Chicken Recipe – simply scroll to the bottom of the page where you can find the printable recipe card. One of the most important things to do to make sure your chicken never dries out, for juicy, tender, and crave-able grilled chicken is marinate your chicken before grilling. Marinating your grilled chicken should not be skipped – it helps lock in tons of flavor and chicken’s natural juices so you’re not stuck with dry grilled chicken. Poke holes in the chicken with a fork or knife. This allows the marinade’s flavor to sink in to the chicken better. Keep marinating chicken in airtight container. Food safety is incredibly important when cooking chicken – keep your chicken refrigerated until use. Refrigerate marinating chicken for at least 2 hours. 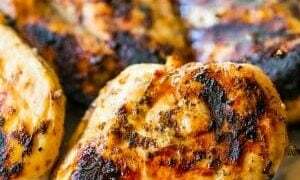 Chicken marinade will flavor your chicken after about 2 hours in the marinade – you can grill after just two hours and still have tons of flavor. Refrigerate marinating chicken for up to two days. Chicken can be left in an airtight container in the refrigerator while marinating for up to two days. For extra juicy chicken, grill in foil pouch with marinade. Making a foil pouch for your chicken breasts in a little extra marinade and sealing it up before throwing it on the grill will give you incredibly juicy and tender chicken. But really – don’t use the marinade your raw chicken has been in on other dishes to cut the risk of cross contamination and salmonella. 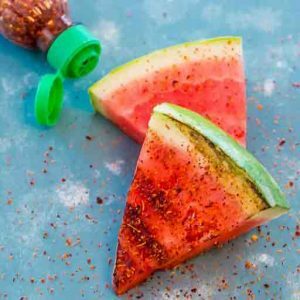 There are a ton of easy ways to infuse flavor in your grilled chicken marinade – try some of these amazingly delicious Grilled Chicken Marinade ideas! 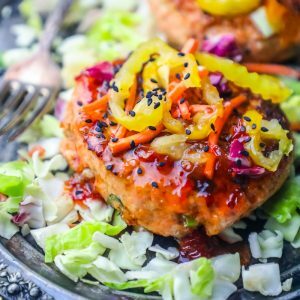 Swap Italian Dressing for a sesame soy dressing and add scallions, garlic, ginger, and a dash of sriracha to the marinade for a delicious Asian Inspired twist! 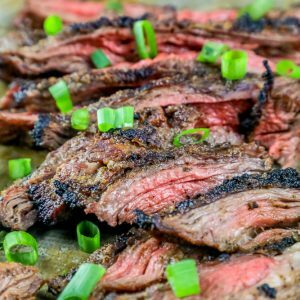 Swap the Italian dressing for 3 cups teriyaki sauce or teriyaki coconut aminos (for a keto swap) + 1 onion, sliced, and sesame seeds. Use 1 cup olive oil, 1 cup white wine vinegar, 2 tbsp garlic powder, 1 tbsp dried oregano, and the juice and zest of 1 lemon for your marinade. Use 1-2 cups cajun butter (sold as an injectable marinade often) instead of soy sauce and Italian dressing. Add bell peppers and onions for even more flavor – grill with chicken for an all in one cajun grilled chicken dinner! Swap Italian dressing for 1 cup soy sauce + 1/2 cup sweet chili sauce, 1 tbsp garlic powder, 1 tbsp sesame seeds, and 1 tbsp ginger for a delicious sweet and spicy grilled chicken marinade! While I prefer fresh grilled chicken, sometimes you’ll have leftovers you can’t get to right away – or want to prep meals ahead of time. 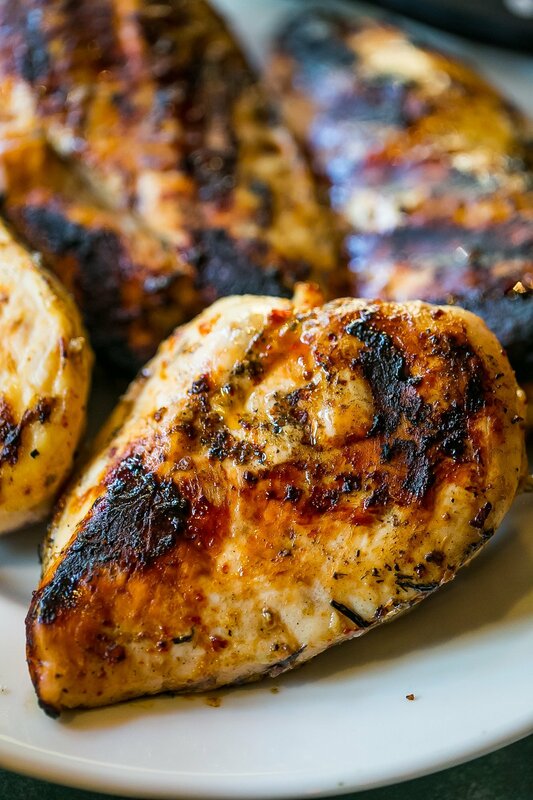 These tips will help you freeze and reheat grilled chicken without drying it out. Don’t cut up chicken before freezing. If you’re grilling whole chicken breasts, don’t cut them up when freezing to keep the surface area open to freezer burn less. Freeze chicken breasts individually to “set”. We want to prevent chicken from sticking together in the freezer – since chicken frozen solid together will thaw a lot less evenly. To freeze individually, place on a large cookie sheet lined with parchment paper. Pop chicken breasts onto parchment paper and freeze until “set” – about 3-6 hours in the freezer. When chicken has initially frozen, remove from baking sheet and add to ziploc or vacuum sealed bag and freeze up to one month. Remove any extra air from container or bag when freezing. To prevent freezer burn, be sure to remove as much extra air in the bag as you can. 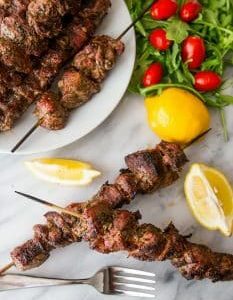 If you love this delicious, juicy, never-dry grilled chicken recipe be sure to check out my other favorite grilled dishes! 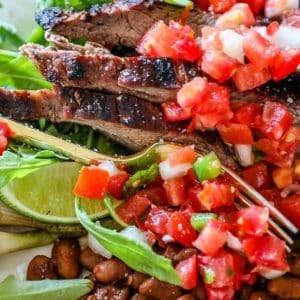 Simply click the links below to find the easy printable recipes of my favorite grilled dishes. 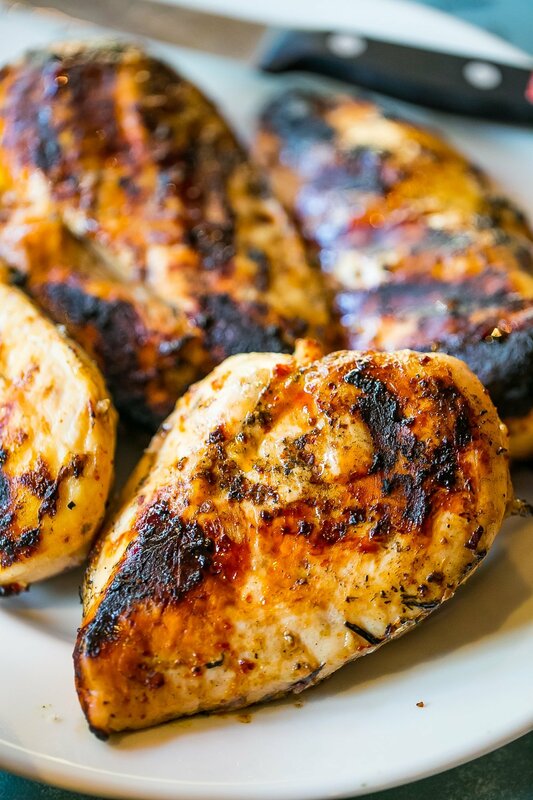 If you love the Best Grilled Chicken Breasts Recipe as much as I do, please write a five star review, and be sure to help me share on facebook and pinterest! 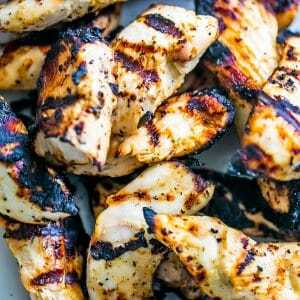 Delicious, never-dry juicy and flavorful Perfect Grilled Chicken Breasts are perfect for cookouts and picnics - or even chopped up cold for a sack lunch salad, wrap, or sandwich! Put chicken breasts in a large zip bag and cover with Italian dressing, garlic powder, and soy sauce. Gently squeeze the air out of the bag. Shake bag so all the chicken is covered with dressing. Place the bag in a bowl and refrigerate overnight. Pre-heat and clean grill- rubbing ½ an onion on the hot grill cleans and flavors the grates. Remove chicken from bag with marinade. Cook chicken on medium high heat until 165 internal temperature, about 15 minutes. Enjoy when hot, or refrigerate and use for s sack-lunch. This sounds so yummy. I’m going to make it tonight. 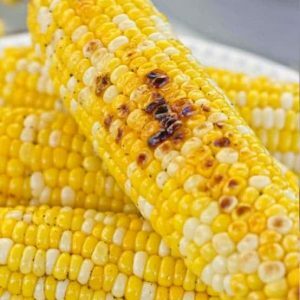 Thanks for the recipie!! I’m trying to diet and always looking for new chicken recipes. I can’t wait to try this in a foil wrap. Thank you! This has some great info on grilling chicken! Thanks! Can’t wait to try this marinade in a foil pouch. ?? Could your site have any more ads? Awful and unusable. Will never be back. 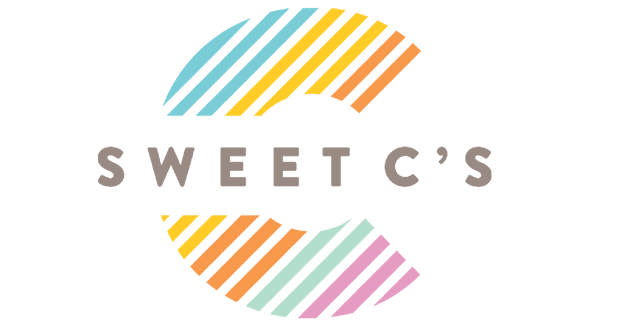 Do you know how much time and money goes into running a site like this? Just expenses run into the thousands of dollars a month (hosting a website, paying for software that displays recipes, paying for share buttons, image storage, ingredients for recipes to develop, tech support, etc etc etc…) so while I understand nobody loves ads, I have them in my site because this has become a fulltime job, and as such, I made the choice to make money from this project for my family. If you don’t like ads, there are a ton of subscription sites – or recipe ebooks – that charge upfront instead of making money off putting up free content with ads. I don’t add them lightly – but I believe everyone should be paid appropriately for their work, and that includes my own site. Well that was very rude after this lovely woman took the time out to give us a delicious recipe and grilling tips. Thank you and I will be trying it later on today in a Caesar salad. Quick and not too heavy for summer. Can’t wait ? What do you do with the soy sauce?